Ready for Christmas. – Mumma days. Hey guys, so this year we decided even though we are living at home with my nan we would still celebrate Christmas properly now we have Alf. This meant that we HAD to get a real Christmas tree 🎄 this also meant we HAD to put the lights up around the house and HAD to hang tinsel off every single ledge of the house! We are so buzzing for Christmas this year. This Mumma has been on the ball and although I’ve had all the presents sorted since maybe November. We got the last few bits the other day and we’re also going to the shopping centre on Friday. We’ll do what we always do. Me and Alfie will go one way and daddy will go the other then once we finish we’ll meet back up and we will head home together. 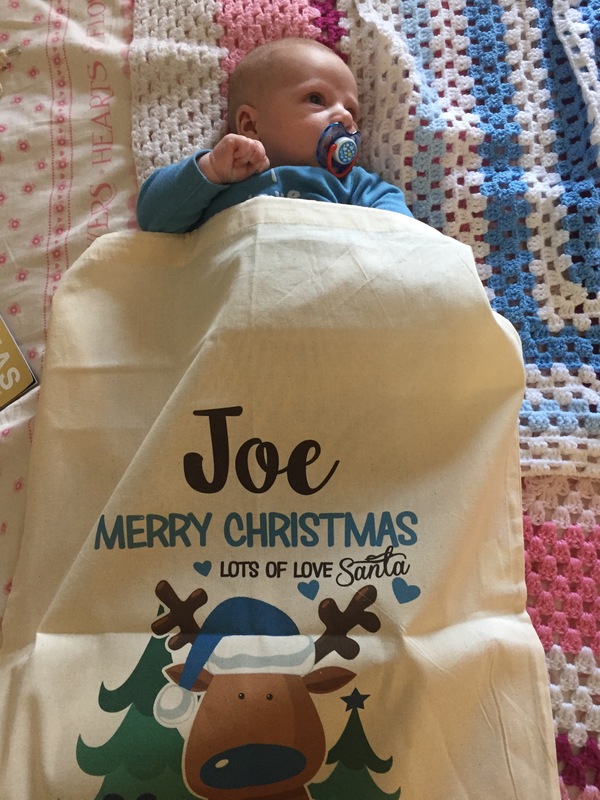 It’s difficult when it comes to buying for joe because although he tells you what he wants and there expensive and I could get away with buying him that and nothing more he also has a santa sack the exact same as Alfie’s so I have to fill that too!! Alfie’s pretty awesome to buy for I thought it would be really difficult buying for a baby and if your planning on going in places like babies r us. It’s going to be difficult because honestly you can’t find a single toy for babies, swings and rockers yes but no fun toys to play with. And Alfs at that stage where he’s intrigued with toys. So either do your shopping online or go in somewhere like the early learning centre as they have a full range of baby. Alfs got lots of different things he goes from clothes, toys, bouncers and books! Is it silly that even though my son is only going to be 4 months old on the day but I can’t wait to put a glass of milk, a carrot and a mince pie out for santa and Rudolph on Christmas Eve and then I can’t wait to put him to bed and then take all of his presents downstairs and set them all up so it’s all magical when I take him down. Our typical Christmas? We’ll all go downstairs in our jarmies, make a cup of tea then start un wrapping. So just some things I’ve noticed while I’ve been shopping don’t know if anyone has any idea but I spent 32£ in m&s the other day and once reading the receipt it said I could have earned 320 sparks points if I had a card.. I might have to get one! Also when you buy at the moment I think they give you a voucher if you spend over £20 they give you a voucher for £5 off if you spend over £50 which is good if your planning to go there to do you Christmas food shop. The early learning centre (ELC) has a sale on some of the products, and also have a Lamaze section which I never new about! Gymshark keep having flash sales which are sales of around 50% off which is great!! Hope I’ve helped or killed some time for you! ← Have a baby they said..